I was invited to Taco Love Grill by owner Mena earlier this week. Yesterday, we took her up on the invitation and left the restaurant full and happy. 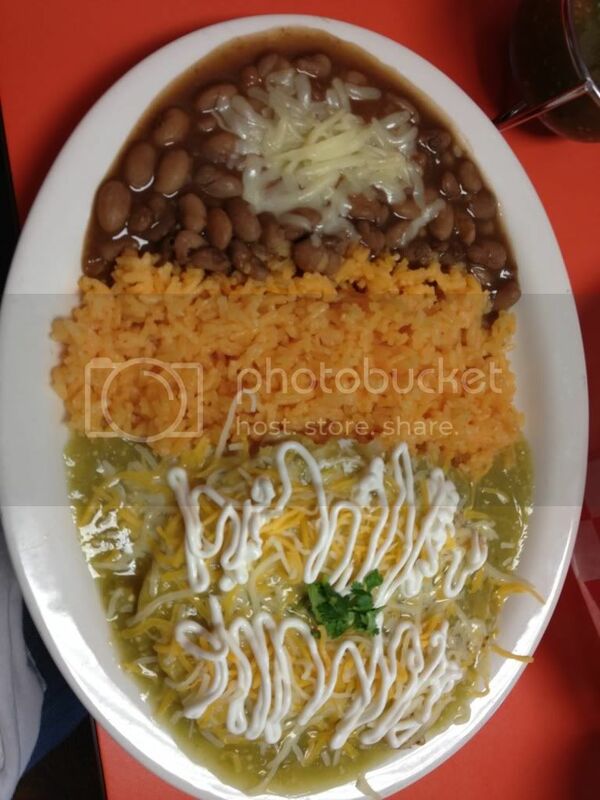 The food was great and the staff was extremely welcoming and attentive. Had we not been invited we may never have found this hidden gem as it's very much hidden and off the beaten path. Let this be your invitation to seek out this restaurant as soon as possible. The extra miles in the car are well worth it. We started off our meal with a basket of chips and salsa. The chips were freshly fried and the salsa verde and roja they served on the side were both delicious. The verde was the more mild of the two and offered a fresh citrus flavor. The roja had a nice smokey flavor and brought some nice heat to the party. I shouldn't forget to mention our beverages. I had Tamarindo and Deana had a Hibiscus tea. Normally, I wouldn't mention my drink choice when it's not a cocktail or beer but these stood out. I was having a heck of a time coming up with a descriptive way to explain these drinks yesterday and I'm still at a bit of a loss today. All I can say is that these drinks are a much better choice than the everyday soda or bottled beverage. For dinner I ordered the shrimpotle burrito which came recommended by Mena and Deana ordered the verde Enchiladas. Both meals were filling and full of flavor. In fact, I can say with confidence that I haven't had a better burrito in the area. 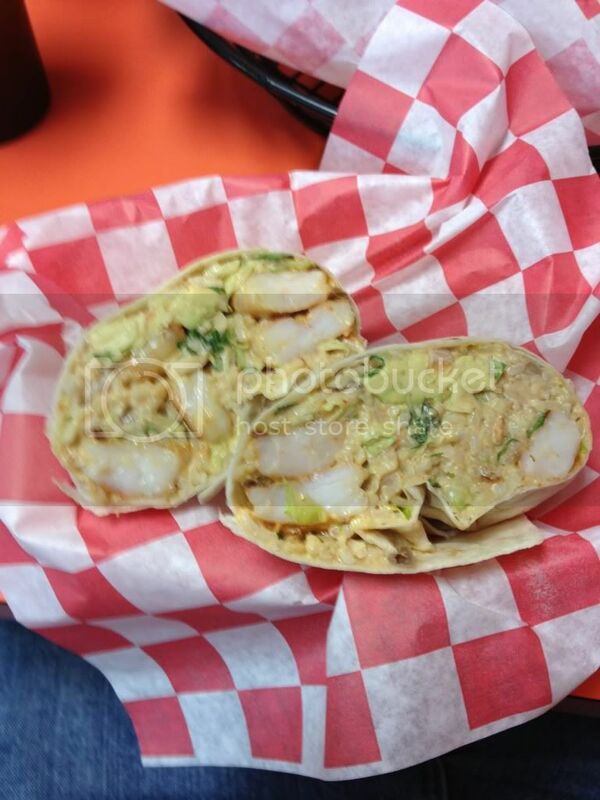 It comes stuffed full of shrimp with a cheesy rice mixture and bits of cilantro and guacamole. It didn't need help, but I still had fun putting on the salsas I mentioned previously and also another corn salsa they offered. Deana's enchiladas were also a hit. The chicken was tender and I don't know who wouldn't be happy with anything found underneath their out of this world verde. As we were driving home Deana happily proclaimed these were the best enchiladas she has had. It was hard for me to disagree. 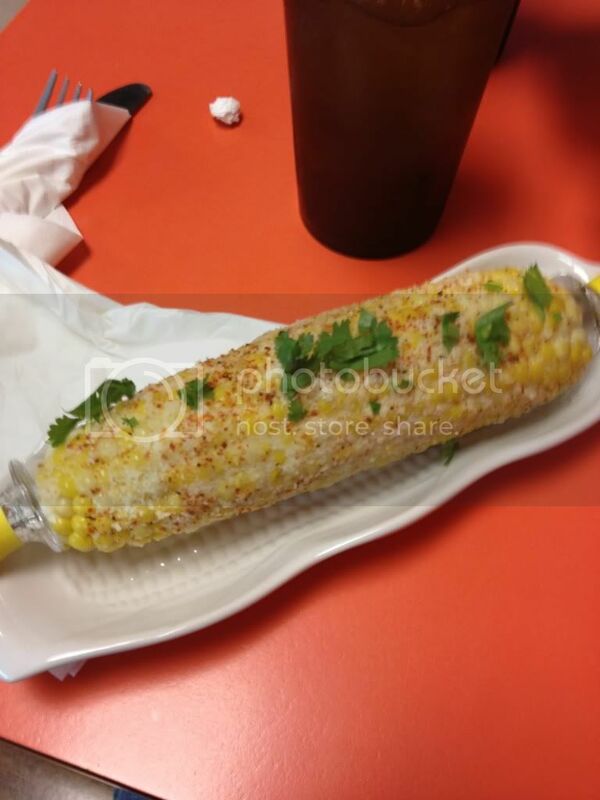 As good as our meals were, though, the highlight of the night for me was the Mexican Corn on the Cob. I love corn on the cob, but this variation might have spoiled me for life. I'm not sure I ever want a plain piece of corn again. I woke up today thinking about the flavors on this little masterpiece. The corn is topped with mayonnaise (don't be afraid), cheese, and something spicy like cayenne, and I suspect some lime was squirted on it. The flavor was out of this world. The corn was sweet, the mayo and cheese were creamy, there was spice there, and the citrus made everything pop. If you end up at Taco Love Grill and find yourself confused about what you want to order be sure you don't pass this up. As far as I know, nobody else in the area is serving anything like this. As if that wasn't enough food we were also treated to a delicious dessert. We had a plate of sweet tortilla chips that were sprinkled in cinnamon and sugar. The taste was reminiscent of a crunchier churro and they were served with a raspberry dipping sauce. They were very good, but if you save room for dessert the chocoflan is the way to go. Until last night I had never tried flan, but that definitely won't be the last time. I never really knew what flan was but if I knew it was basically a light and airy custard like concoction I wouldn't have waited so long to seek some out. 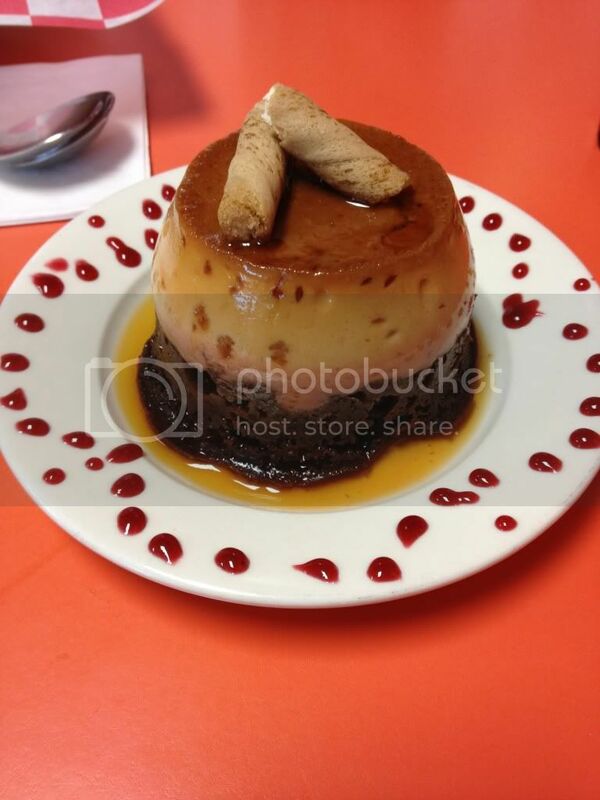 The flan sat on top of a super moist piece of chocolate cake and all of it was topped in a thin caramel sauce. This is a dessert worth breaking a diet for. If you've made it this far into my post, please do yourself a favor and seek Taco Love Grill out. This restaurant has great food and it deserves to be talked about and frequented by people from all over the area. Best of all, the staff is great and they go out of their way to make sure that you're happy with your dinner experience. 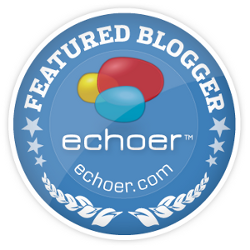 Recommendation: Visit them today and tomorrow! What to Order: Don't pass on the Mexican Corn on the Cob and Chocoflan. There is now trifecta of mexican spots in Baltimore County. The other two, R and R (now at Honey Go Shopping center) and Fiesta Mexicana and Taco Love Grill. I'm glad you mentioned R&R moving. I had no idea. I walked into the mall one day and they were gone. Glad to know they are still close by. R and R is byob now as well. Good times.